UFC 162 was a much anticipated event with one of the pound for pound greats in the sport Anderson Silva set to fight Chris Weidman. This was Silvas 11th middle weight title defence however that run has ended in devastating fashion, with Weidman knocking Silva down with a powerful left hook and then following up with ground and pound to have the referee stop the bout at 1:18 of the second round. This result will surly send shockwaves around the UFC and put the relatively inexperienced Chris Weidman right up there in the pound for pound rankings in the UFC. The first round started with Weidman successfully taking down Silva, landing some punches and scoring blows, but nothing that notably troubled Silva and Silva eventually worked his way out of trouble and returned to his feet. The champion Silva then began to taunt Weidman by dropping his hands and inviting him to come and throw punches, Weidman took him up on the offer, but for the most part his attacks weren’t finding their target, Silva returned with his own kicks and punches, but with nothing that troubled the challenger. Weidman defiantly takes the first round 10-9. The second round started much like the first ended, with Silva taunting Weidman and inviting him to attack. 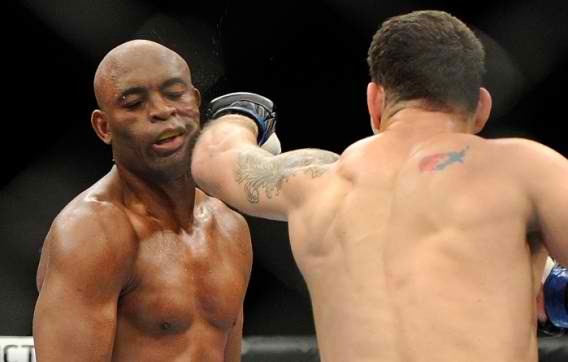 Weidman stuck to his own game and attacked with some punches and a failed takedown, Silva continued to taunt him. Silva again dropped his hands in front of the challenge, however this time Weidman makes Silva pay for it, and lands a powerful left hook that sends Silva to the canvas. Weidman followed up with an attack and the referee quickly jumped in to stop the bout. This victory for Weidman stunned a lot of critics as Silva was the favorite to win this fight. With Silva losing, it makes the much talked about potential future bout with GSP appear less appealing to fans. Other bouts of the night saw Mike Pierce win via TKO in round 2 over David Mitchell in the welterweight division. Along with this Brian Melancon won via TKO in round 1 against Seth Baczynski and Brazilian prospect Edson Barboxa won via TKO in round 2 against Rafaello Oliveira.